A survivor who escaped being killed by Fulani Herdsmen has told the story how Enugu farmers were brutally murdered in broad daylight. An eyewitness has narrated how Fulani herdsmen armed with sophisticated guns and machetes massacred about 40 persons at Nimbo in Uzo-Uwani Local Government Area of Enugu State. 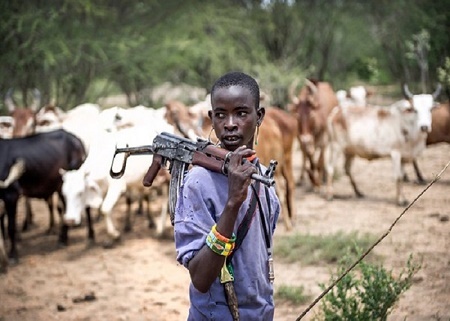 The incident took place barely 24 hours after stories filtered out that no fewer than 500 heavily-armed Fulani herdsmen sneaked into the community ready to launch an attack. Seven villages in Nimbo (Nimbo Ngwoko, Ugwuijoro, Ekwuru, Ebor, Enugu Nimbo, Umuome and Ugwuachara) were affected during the attack. It was also gathered that ten residential houses and a church, Christ Holy Church International, aka Odozi Obodo, were also said to have been burnt by the herdsmen just as vehicles and motorcycles were destroyed and domestic animals killed. According to Vanguard, a young man was burnt inside a commuter bus belonging to one Ejima, son of a prominent man popularly called ‘Are you there’ near the Christ Holy Church, Nimbo. Narrating the incident, Kingsley Ezugwu, former Councillor, Nimbo Ward 2, who was also attacked revealed what happened from his hospital bed in Nsukka, Ezugwu said: “I was coming out from the house when I heard the community bell ringing. I was going with a friend to know what the bell was all about, only to see about 40 Fulani herdsmen armed with sophisticated guns and machetes. He said one of them later discovered that he was alive and called on the others to finish him off. They ignored him. He said he crawled until a good samaritan helped him to the hospital. About six dead bodies have been recovered and deposited at Bishop Shanahan Hospital, Nsukka, while others, who sustained injuries were rushed to Royal Cross Hospital and Enugu State District Hospital, Nsukka. Meanwhile, villagers and other residents of the area have all ran away to safety.